Gone are the days when accountants used paper ledger books and a sharp pencil to record accounting entries. Computerized accounting has become commonplace in many firms, from Fortune 100 companies all the way down to one-person solopreneur businesses. 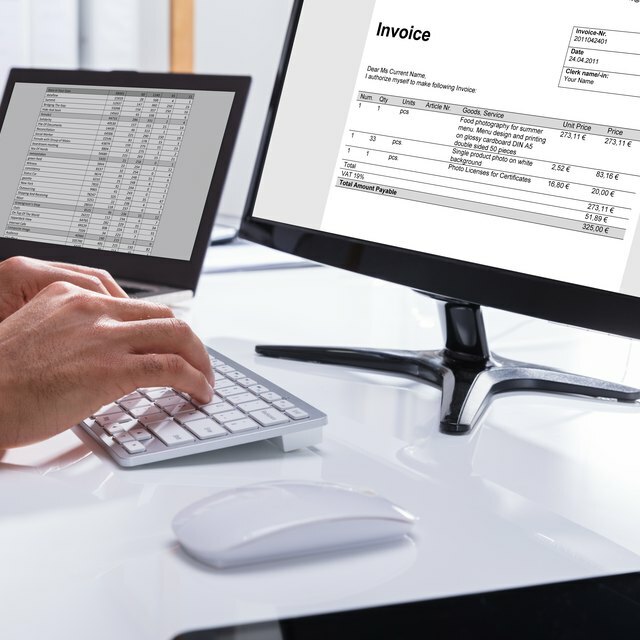 Due to the internet and the availability of both online and desktop-based systems, the cost of accounting software has come way down, and some vendors even offer scaled-down online bookkeeping systems at no cost. While these systems may have some limitations, such as not being able to track inventory, they typically provide enough functionality for smaller or service-based businesses such as consulting and other service-related firms. What Is a Computerized Accounting System? A computerized accounting system consists of software designed to track all of your company's accounting transactions, with the goal of producing financial output for monthly reports, annual financial statements, tax return information and other report configurations used to analyze your company’s operations, efficiency and profitability. While free or low-cost online software systems don't offer much customizability to your specific business, larger companies often use a computerized accounting system software package that has been installed on the company's mainframe computer servers and made available to several users. This type of large-scale computerized accounting software often comes with a large degree of customizability. Companies can have the software designed to accommodate multiple currencies, business entities located in different parts of the world and branches of the company that sells different sets of products. Also, it can be customized to produce an array of financial reports that calculate key performance metrics specifically geared to the company’s industry and operational benchmarks. Who Uses Computerized Accounting Systems? It seems that just about anyone in business can use a computerized accounting system these days because of the variety of solutions available to fit the needs of virtually any size and type of company. For example, a very popular accounting software, Quickbooks, has been used for many years by a range of companies from small to mid-size. The company offers both online and desktop versions of its software, and the software accommodates a decent amount of customization at a fairly economical price. The work involved in setting up a computerized accounting software system varies depending on the size and structure of your business. For example, if you work as a consultant with no employees, you may be able to start using an online accounting software right away to record your hours spent per client, store all of your clients’ name and address information, produce invoices and record the payments from your clients. If you allow clients to pay within 30 days, for example, off-the-shelf accounting software has the receivables account built-in, allowing you to record the transactions and then see all of your outstanding payments due from customers, along with the date you issued the invoice so you can see the age of your outstanding invoices. For a company with more complex operations, most software allows you to design a chart of accounts with account codes and categories unique to your company and the type of business. This can help keep data organized when you record entries for certain business units or departments, for example. It would also allow you to generate a set of financial statements or reports to look at the profitability of your company by unit or department, depending on how you’ve designed your system. You can record your accounting transactions on either a cash or accrual basis in most accounting software. Put simply, the main difference between the cash and accrual accounting systems lies in the presence of accounts receivable and accounts payable. Cash and accrual accounting differ based on how you record the timing of your cash receipts from sales and money spent to pay your expenses. When you pay for things or get paid in cash, sales and expenses get recorded in real time. When you use accrual accounting, you record sales when you earn them and expenditures when you incur them, even if you haven't received the sales revenue or paid the expense yet. For example, in an accrual accounting system, you would make an entry each month to accrue money for an insurance policy that you need to pay at the end of the year. You would record this entry in an asset account called prepaid insurance. You would record the transaction as if the money had already been spent by reducing the balance of your company's cash account and correspondingly increasing the balance of your prepaid insurance account each month. Are Tax Returns Cash or Accrual Basis? Good reasons to use accounting software include the data collection and reporting functions. When tax time comes around, the software makes it much easier for you to accumulate your revenue and expense data to accurately and efficiently complete your company’s federal and state tax returns. The accounting data that you use to populate your tax return may be on either a cash or accrual basis, depending on the size of your company and the accounting method you have chosen to use. The IRS has certain rules that will help you decide whether cash or accrual accounting fits your business best. For example, if your company earns less than $1 million in revenue each year, you can use the cash method of accounting. If you have inventory though, the IRS does require you to use accrual basis accounting for the inventory portion of your business specifically. With a few exceptions, if your business is a C corporation, the IRS requires you to use accrual basis accounting so that you would file your tax return on an accrual basis. When your company files its first tax return, you will choose either the cash or accrual method. The IRS requires you to choose whichever method gives the most complete and accurate view of your company’s income and expenses. It also requires you to use the same method from year-to-year. Otherwise, it becomes very difficult if the IRS needs to compare your current data to your historical figures. If you decide to change your accounting method, you must use IRS Form 3115 to request permission. Computerized accounting software can be bare-bones, providing the bookkeeping basics, or you can use a fully-fledged software solution that offers not just bookkeeping, but also inventory management, distribution tracking, manufacturing and work-in-progress tracking, customer relationship management, time and project management and more. Because of the continuing software evolution, accounting packages can do more of the day-to-day transactional tasks and free you up to do other value-added work in your business. It pays to think ahead to how you envision your business growth and make sure that your accounting software is scalable, meaning that it can accommodate extra accounts, additional business units and can handle a larger number of inventory units or tie into a third-party barcode software system, among other things. If you operate a retail store, for example, you can have your cash register transactions automatically recorded in accounting software depending on the system you choose, using a barcode scanner and coded product tags to enter the information into your system. Using accounting software offers your company several benefits. First and foremost, the structure and discipline of a computerized accounting system ensure that your company can produce accurate financial statements. This is especially important if your company needs to provide these for external uses such as bank financing, or if you need to present your financial statements in accordance with generally accepted accounting principles (GAAP). Accounting software can save time, especially if you want to create a budget or forecast. You just need to generate a report of your historical data and project it forward with a few tweaks to produce your next year’s budget or forecast. You can also streamline and add efficiency to your overall accounting process, especially if you can cross-train administrative employees to help out with some of the more routine bookkeeping tasks, such as entering bills to your payment system, for example. When you generate company invoices, your accounting software automatically adds the amounts to your company's accounts receivable balance. All of this functionality working together within the same accounting software reduces errors and helps you make sure that you don't let any transactions slip through the cracks. A few downsides exist for using computerized accounting systems, although they still make more sense than keeping your books with ledger paper and a pencil. Once you understand the potential downsides, you can take steps to make sure that these issues don't become a problem in your business. Accounting systems can be complex and somewhat difficult for staff to use. A barebones accounting package may be just right if you or your staff has no desire or requirement to understand the nuances and detail of accounting. If you have a more established company, or one with a complex structure that includes inventory, work-in-progress, several business entities and intercompany transactions, for example, your company will require a much more complex accounting system along with more highly-trained staff to manage it. You may have ongoing costs for an accounting system. If you choose the online version of Quickbooks for example, you'll have an ongoing monthly fee. Larger software packages, especially those installed on your company’s server, often charge for licenses. For example, say your company has 10 people that need to access your accounting system. The software provider might charge you either a one-time, annual or monthly fee for each user license in addition to the base cost for the software purchase. As with any software for any purpose, developers constantly improve and update the software so that it can evolve with changes in computing or changes in the field. Due to this, expect to have occasional downtime, especially if you use online-based software, and make regular data backups an important part of your accounting system. Do your research when selecting the right computerized accounting software for your company. It's no fun when you do all of the work to implement the software and load up your data, only to find after a year or two that your chosen software either has too few features and cannot accommodate your growing business, or has too many extraneous features that make it more complicated than it needs to be. Customer service is another crucial element, so choose a company that can provide you with, preferably, 24/7 support and a live person to talk to rather than just an online knowledge base. Also keep in mind that if you use a cloud-based accounting system, sensitive financial information could be exposed to online hackers, so take steps to secure your company's internet connection and data. If you started your business off using pared-down accounting software, or even a manual bookkeeping system, at some point you might decide to upgrade your computerized accounting to bring your business to the next level. To make the transition painless and set your company up for accounting success, it helps to do some prep work before you make the transition to a new accounting software package. Start by cleaning up your historical data, because if you have accounting information that contains incorrect, miscoded inputs or incomplete information, these mistakes will carry over to your new system and make it more difficult for you to have integrity in your accounting books. Transition over to your new system at the end of the year or at least at the end of a quarter, so that you can have a clean cut-off date. This will help you in the future when you need to look back at certain historical transactions. Next, look over your company's chart of accounts for any errors and add any new accounts as necessary. Review your customer list, vendor list, list of employees and any other lists contained in your accounting software that could include old, unused accounts or duplicate entries. Have your accountant audit each general ledger account on your company's trial balance to verify that the account balance is indeed accurate. Your new system may not be able to accommodate the detail behind these transactions, meaning that if you carry forward an account balance containing errors, you won't have any information in the new system to help resolve mistakes or inaccuracies. Finally, consult with your accountant or CPA to see if he can review your system setup, and recommend any modifications that could streamline or add efficiency to your accounting workflow. Thompson Greenspon CPAs: Cash vs. Accrual: Are You Using the Right Accounting Method?